Thanks to National Lottery players, the next stage of the Tooting Common restoration project is now underway. This morning (Wednesday) work began reviving the common’s valuable and rare grassland habitat. The work, which is part of the wider Tooting Common Heritage Project, involves shallow scraping and the removal of nutrient rich soil on the Lido Field and on Tooting Graveney next to the running track. This will help recreate the delicate acid grassland landscape which provides a rich habitat for invertebrates like butterflies and grasshoppers. Tooting Common covers 220 acres and is the largest open space in the borough of Wandsworth. It is designated a Site of Metropolitan Importance (SMI) for Nature Conservation. 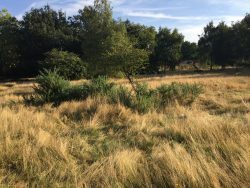 Often associated with low lying heathland, parkland or around coastal cliffs, acid grassland typically occurs on nutrient-poor free-draining soil and is extremely variable in terms of species richness. It is one of the common’s characteristic features, providing an unusual but much loved landscape. Supporting this kind of rare habitat is a national and local priority. Last year Wandsworth Council was awarded just under £1.4m by the Heritage Lottery Fund (HLF) to restore, conserve and enhance the cultural and natural heritage of Tooting Common. Another £500,000 is being match funded by various partners including Transport for London, The Woodfield Project, Wandsworth Council and Enable Leisure and Culture. As well as restoring the acid grassland, the HLF-backed project will also see the restoration of the Woodfield Pavilion to offer toilets and meeting space for local community groups and pay for extensive refurbishment work at the popular Tooting Bec Lido. It is also funding restoration of the lake and the common’s 1930s drinking fountain which is being cleaned, repaired and brought back into public use. It is also funding the planting of new trees to replace those on Chestnut Avenue which are in serious decline. As well as restoring ancient habitats and boosting biodiversity, the HLF scheme is also offering new volunteering opportunities for local people that not only improve the common but give those who take part useful new job and life skills. It will also see the compilation of ‘The Common Story’ – a project that will work with volunteers to unravel some of Tooting Common’s historical mysteries and provide research and archive training to those taking part. For more information about the project please email skryuchenkova@wandsworth.gov.uk or visit the council’s website. The Tooting Common Heritage Project has been initiated by Wandsworth Council, with funding from the HLF, and is being delivered by Enable Leisure and Culture in partnership with the South London Swimming Club, idverde (formerly Quadron Services Ltd), The Tooting History Group, Wandsworth Historical Society and The Woodfield Project. The aim is to improve and monitor biodiversity and habitats, to conserve and restore heritage landscape and architectural features, uncover the hidden history of the common as well as teaching people about the its rich past and biodiversity. It will provide new volunteering opportunities and transferable skills to local residents.